With Safety Inspect, you can decrease the amount of pre-assessment prep time by viewing a single source of all the most up-to-date refinery information, safety goals, relevant checklists, contacts and manuals. The app provides a compliance check for audit completion, ensuring that a standardized, compliant method is in place for every audit. Using a mobile device in the field, inspectors have easy access to the day’s schedule, list of inspections and critical details for each job. Safety Inspect helps technicians steward and communicate safety analytics using a KPI dashboard. This can help them better understand safety issues and take corrective action in the field. With the app, they can capture and annotate real-time assessment data with capabilities for documenting notes, taking pictures and recording audio. The app confirms that the inspection is complete and submitted for review so the technician can confidently move to the next audit. Using powerful analytics, Safety Inspect enables plant managers to review safety inspections data on a regional or global level, and get a dashboard view of safety trends and breakdowns. 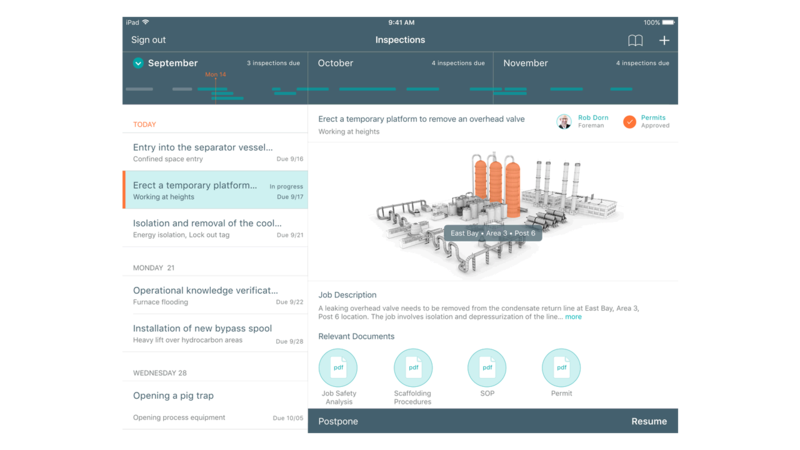 The app provides a consistent inspection experience that enables users to drill down by organization or team, and verify inspector safety knowledge and compliance with procedures. Plant managers can also push changes out to all sites and analyze data from multiple sources in order to gain key insights. Provides technicians with data to easily make repairs in the field. Provides performance tracking for asset maintenance work orders.